Can you believe that school season is almost here? We have already registered our kids for school, bought uniforms, and scheduled eye appointments. The only thing we have left to do is head to the store with a list of supplies that they need before classes start in a week. Thank goodness that high school students do not need as many things as elementary students do. Although, I think I would prefer the cart of crayons, paper, folders, pencils, and rulers instead of the laptop we need to get. I realize that online schoolbooks are the way to go, but I don’t like paying the price for technology. 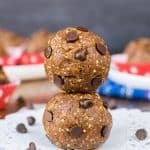 Of course, with all this back to school prep going on, we are also on the hunt for delicious, yet healthy after school snacks. We need to be prepared for the hungry monsters that will be walking through the door at 3 o’clock each day. We try to keep a bowl of fruit on the counter and lots of fresh veggies in the fridge, but sometimes the kids want something other than fruit and veggies. 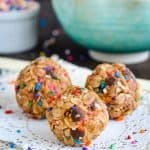 A few years ago I made these Skinny Peanut Butter Granola Bites for the kids and I to snack on one afternoon. 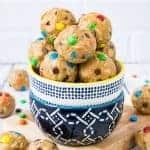 Those soft oatmeal balls and these Healthy Peanut Butter Chocolate Chip Bites are always on repeat every couple weeks in our kitchen. 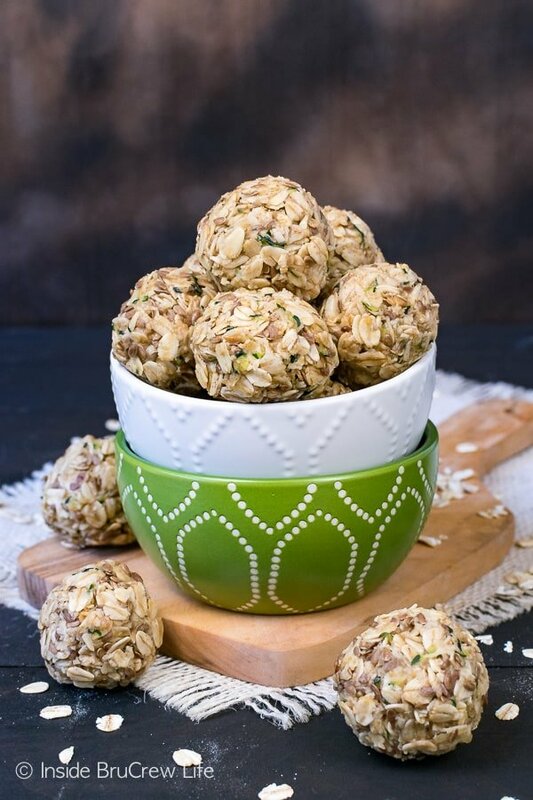 I like to incorporate nutrition, texture, and flavor into our healthy no bake snacks. 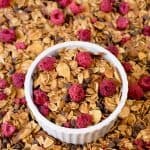 These key ingredients can be changed up depending on what flavor and kind of granola bite you want. 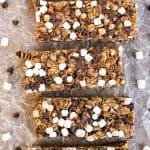 Sweetener: You can use honey, agave, maple syrup, molasses, or brown rice syrup to sweeten your oatmeal bars and bites. These sticky substances coat the other ingredients and help them all stick together. Coconut Oil: This oil has natural saturated fats that increase the good cholesterol in your body making it great for heart health. It also helps to bind the ingredients together when you refrigerate the balls. Nut Butters: My nut butter of choice is peanut butter, but any nut butter will work. 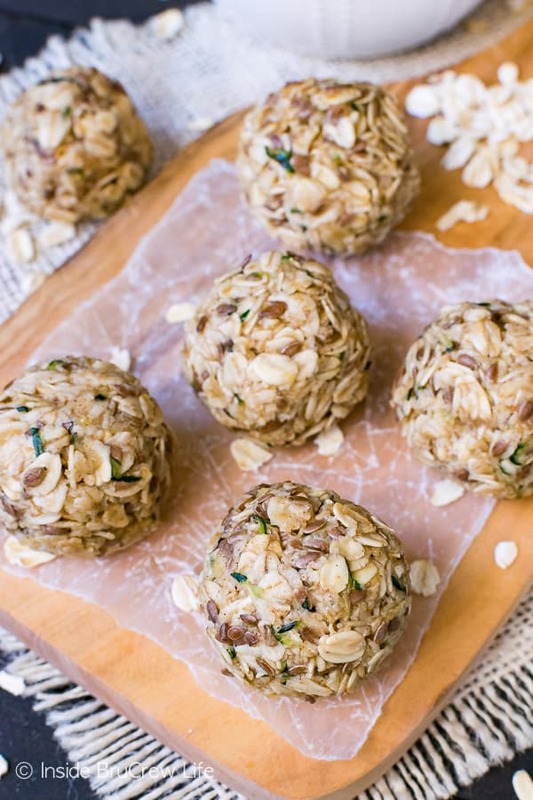 This will also help bind the ingredients together when you start to roll the balls. You can also leave the nut butter out and just rely on extra oil and sweetener to hold everything together. 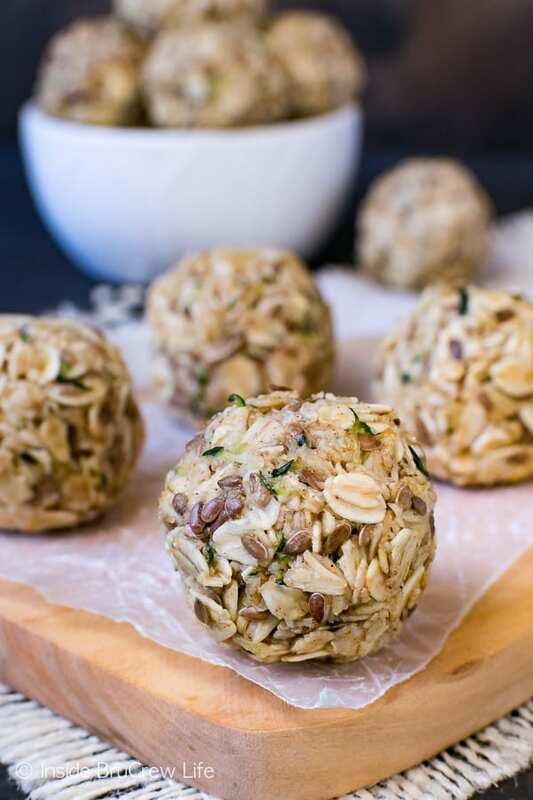 Grains: Rolled oats, quick oats, and rice cereal adds fiber, chew, and a crispy crunch. 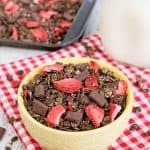 Mix-Ins: Try adding coconut, dried fruits, mini chocolate chips, shredded veggies, flax seeds, spices, oat bran, sprinkles, pepitas, cacao nibs, nuts, and seeds in your oatmeal bites. Not all at once of course. I normally try to choose two or three different mix-ins per recipe. Right now my favorite thing to bake and cook with is zucchini. I am totally and completely obsessed with using it in all the things. 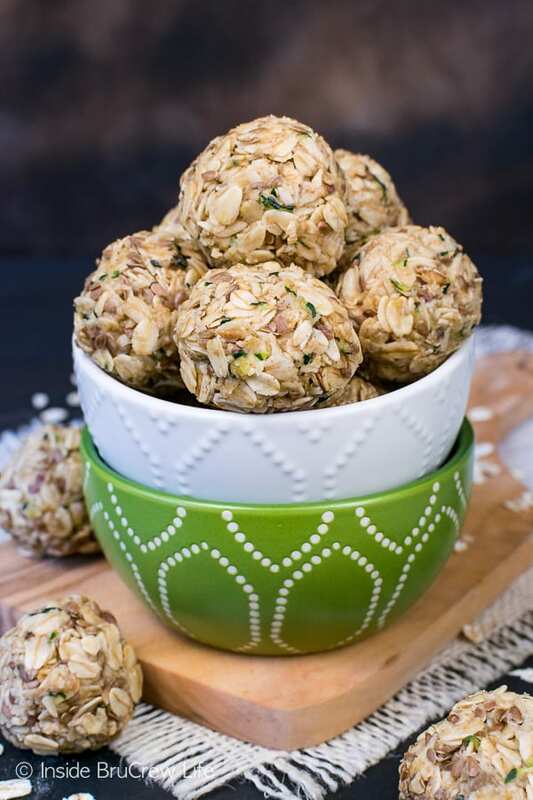 We have enjoyed this green veggie in chocolate muffins, stuffed boats, salad, and in these little oat balls. Next up is another loaf of this Chocolate Chip Zucchini Bread. What else should I make with it? Shred a small zucchini and squeeze the moisture out. You can use paper towels or cheesecloth to do this. Try to get as much of the excess liquid out as possible!!! Melt the coconut oil and honey in the microwave for 15-20 seconds. Whisk in the vanilla. 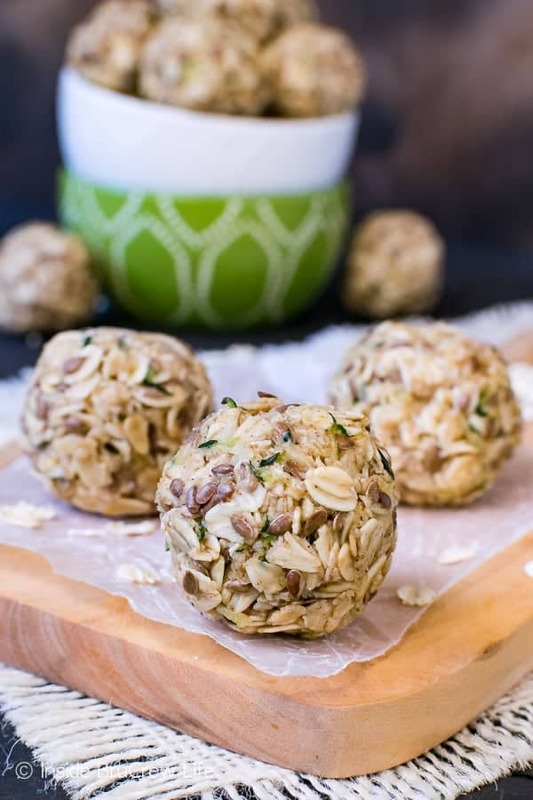 Mix together the oats, flaxseed, cinnamon, and nutmeg in a bowl. Pour the honey mixture over it and stir in until everything is coated. Stir in the zucchini. Place the bowl in the refrigerator and chill the mixture for 30-45 minutes. Remove and stir the mixture together again because the coconut oil and honey will sink to the bottom slightly. Use a cookie scoop to scoop out the oats. Squeeze the mixture firmly in your hands to create small balls. The mixture will be sticky, but it will stick together if you squeeze it tightly enough. 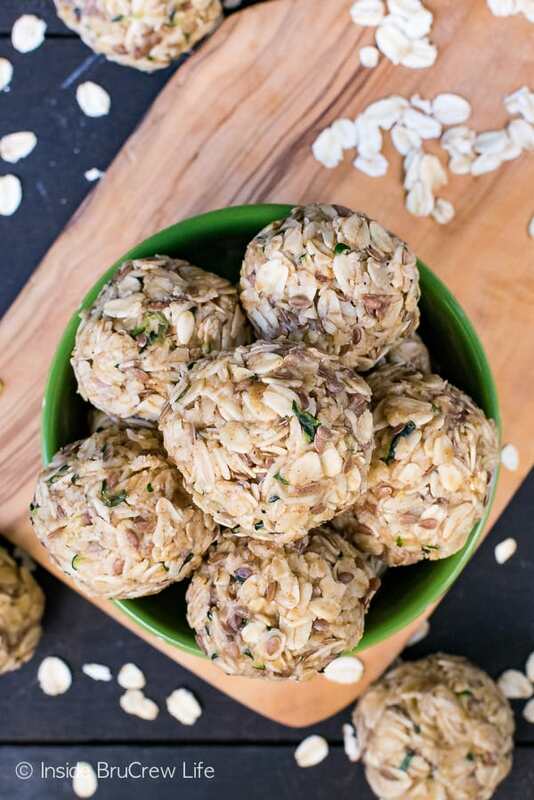 Place the Spiced Zucchini Oatmeal Bites in the refrigerator to completely set up. Enjoy a few for breakfast or a snack any time of day. 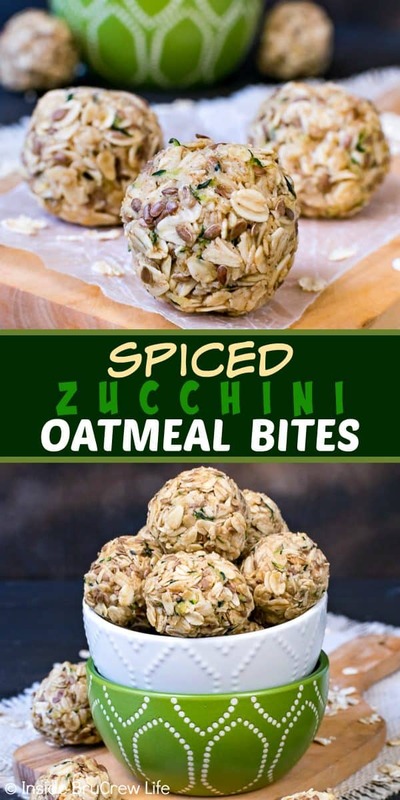 Make sure you head over to Food Fanatic to print this Spiced Zucchini Oatmeal Bites recipe.